If San Francisco has one thing, it is wicked hills! This is the first time I was in San Fran as an active runner, and couldn’t wait to check out the sights. I still think there is no better way to see a place than to have it rolling by you at 7 miles per hour at ground level. I was psyched to get out. With busy days, I had to get up early which meant I was running in the dark, but the city was quiet and the weather was perfect. 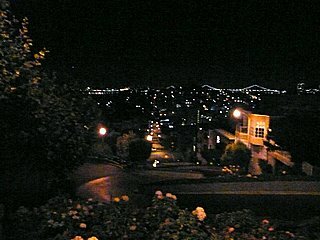 My first destination was the winding hill on Lombard Street. I knew that was going to be a challenge, but I was ridiculously naïve to the challenges before and after. I planned out a route on Powell, Sacramento and Hyde that looked great on MapMyRun, but I was totally ignorant of the hills involved. I mean these hills are insane when you are running them. And my ignorance of the streets meant that after conquering a 2 block demon on one street, I would be rewarded by turning a corner to see another one looming. 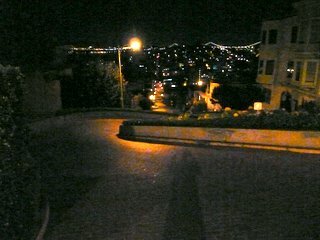 Lombard was a bit gimmicky for running, but still fun. I came at it from the top and did the downhill, but turned around at the bottom and did a round of repeats just to say I did it! The most treacherous part was just watching out for the running water from early morning sprinklers. And little did I know what I was in for on Jones street at the bottom – a completely crazy 3 block scramble uphill. A real thigh burner, but I pulled it off. I came back through Chinatown, which fostered pleasant memories of Shanghai. In the end I did just under 4 miles, but learned that you cannot count miles in this town! It’s all about time and elevation. Was debating whether to go out in Vibrams this morning, and glad I didn’t as I am still in ramp up with them. Coit Tower tomorrow. This entry was posted on October 22, 2008 at 9:57 pm	and is filed under Training. You can follow any responses to this entry through the RSS 2.0 feed. You can leave a response, or trackback from your own site.